Warm up Third world countries and French language: By now, we know about some reality in some African countries when it comes to French and other dialects. 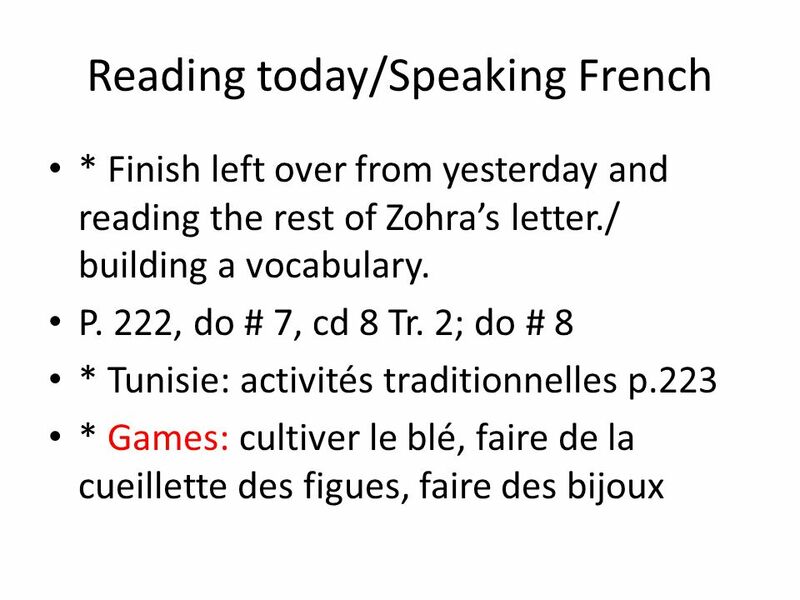 1 Warm up Third world countries and French language: By now, we know about some reality in some African countries when it comes to French and other dialects spoken there. Who are likely to be able to speak (good) French in those countries? Why is it so? ( write minimum of six sentences). 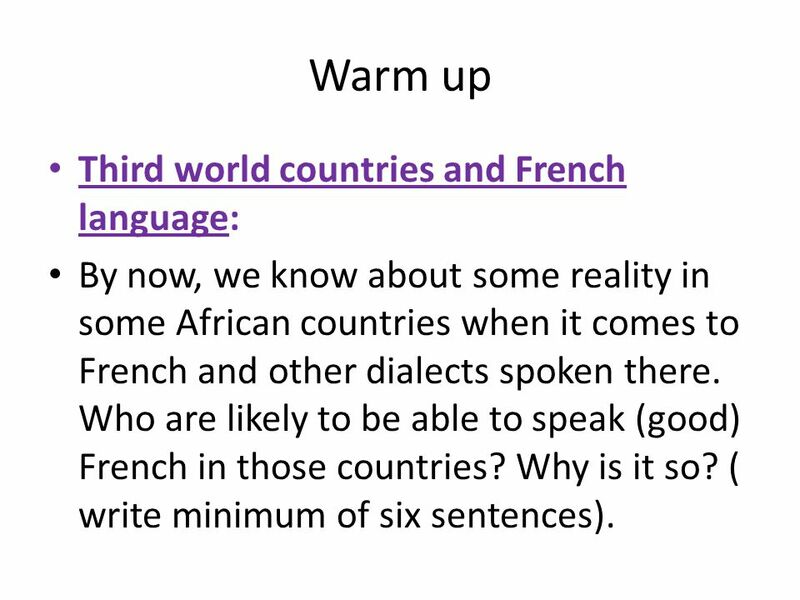 Download ppt "Warm up Third world countries and French language: By now, we know about some reality in some African countries when it comes to French and other dialects." © and ® 2007 Vista Higher Learning, Inc Point de départ Use the subjunctive with verbs and expressions of will and emotion. Verbs and expressions. La vie quotidienne (part 2) WALT: to talk about my daily routine WILF: Be able to give a detailed description of your daily routine, giving times, opinions. Oui, je parle français. 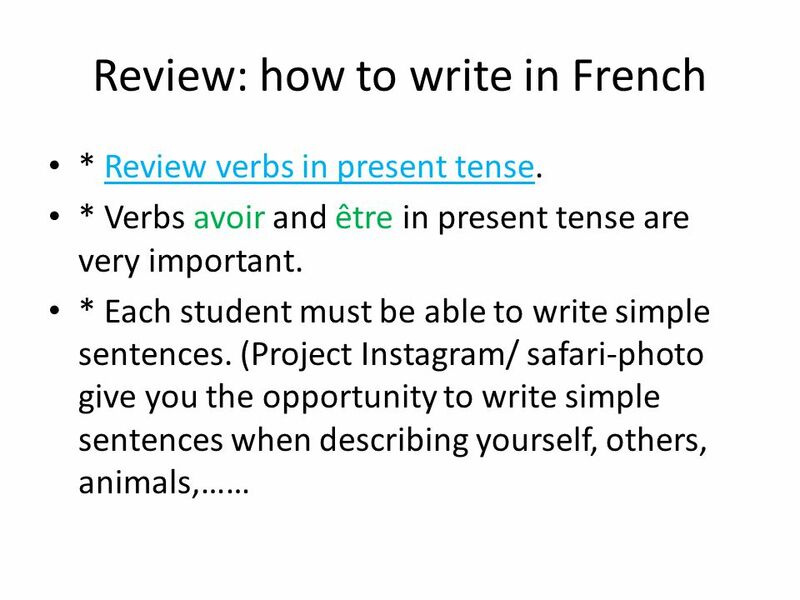 Learning Goals By the end of this unit you will be able to: 1)Use six key French verbs – être, avoir, faire, aller, pouvoir, vouloir. Allez, viens! Chapitre 8. Première Étape Asking someone to convey good wishes. Warm up Write in simple French, what you are trying to accomplish before the age of 30. 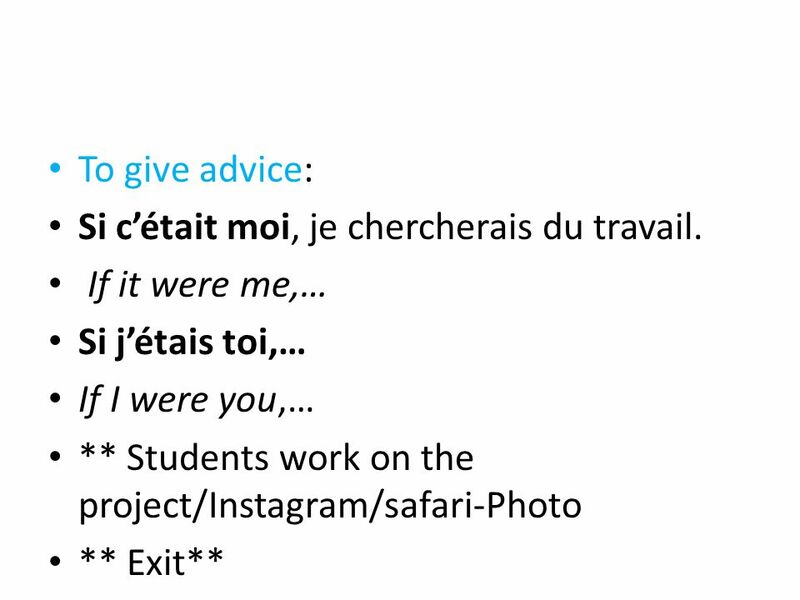 Use French expressions we learn in this class. Warm up Do you agree or desagree with following statements: je trouve le jazz hyper cool. A mon avis, le rock, c’est nul. Le country, c’est pas terrible.